BMW's new X6 features a sharper shoulder line and a bolder front end with a more prominent kidney grille. BMW's second-generation X6 crossover is marginally bigger than the current car. 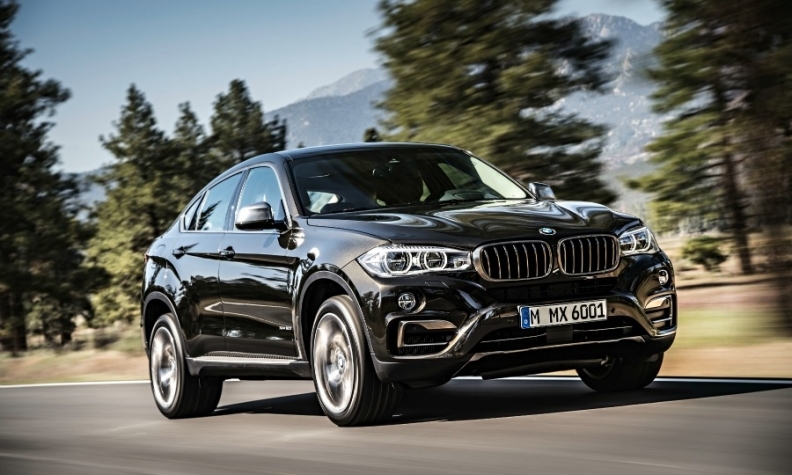 The new X6 will go on sale in December in Europe and the United States. The coupe-style X6 has grown slightly but not as much as earlier disguised prototypes suggested. At 4909mm (193.3 inches) long, it is 33mm (1.3 inches) longer than the first-generation X6. BMW says luggage space has increased by 75 liters to 580 liters, or 1,525 liters when the rear seats are reclined. The X6's new engine lineup will reduce fuel consumption by up to 22 percent, BMW said in a statement. New styling touches include a bolder front end with a more prominent kidney grille and angular headlights that continue into the chrome surround of the grille to emphasize the width. A heavily contoured front bumper, which features so-called air-curtain ducts on the lower outer edges, channels air through the front wheel houses to an air blade duct placed behind the front wheel arches to improve aerodynamic efficiency. The body gets a more structured look than its predecessor, with added contouring on the hood, a more pronounced shoulder line and an added feature line over the rear wheel arches. The re-engineered X6 comes with increased standard equipment levels, including bi-xenon headlamps, 19-inch alloy wheels, automatic tailgate operation and an eight-speed automatic transmission with steering wheel shift paddles. Customers will be able to choose between a V-6 or V-8 gasoline powertrain and three V-6 diesel engines, all producing between 254hp and 443hp. In Germany, the new X6 will start at 66,150 euros, BMW said. The X6 will have its public debut in August at the Moscow auto show.